You can find out more about me and my work throughout the site. I also write for blogs, magazines and websites and have appeared as a speaker at events and conferences including Nine Worlds in London. Some of my favourite authors include Stephen King, Terry Pratchett, John Connolly, Mike Carey, Paul Cornell, Iain Banks, Sue Townsend, and many more that would be too numerous to list here. You can follow me on Twitter @TheOnlyJohnnyA and on my blog where I share writing tips, news, book releases and giveaways. You can even sample my work using the friendly red buttons below. In the meantime, enjoy the site and I look forward to geeking out with you in the future. You can subscribe here to receive posts and writing news direct to your inbox. I only share news and tips on writing so your inbox isn't abused. I hate spam, and I'm pretty sure you do too. April 2017 - I was delighted that my short story 'Thanks for Applying' was shortlisted and received an Honourable Mention in the L Ron Hubbard, 'Writers of the Future' quarterly competition. You can find out more about this competition and its alumni here. 'A must read for anyone looking for a gentle nudge out the door." 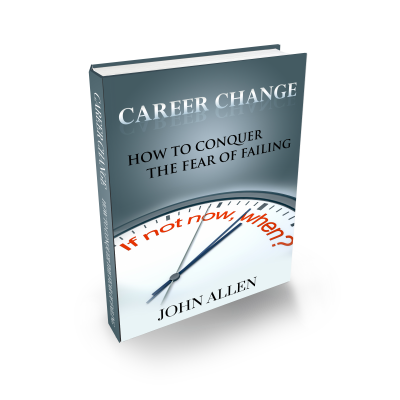 I share writing tips and career change advice on my blog and have written a book about career change - something many people struggle with in their lives. Simply click the button below to get your FREE COPY! Highly Imaginative! Easy to work with and understood requirements from VERY basic input and great results! Great book of short stories, I read them all in one sitting. All different but all gripping. John, thank you for all your work this year - you certainly live up to everything you promise! John wrote a brilliant and engaging story, and was happy to edit it until it was perfect!! John is really imaginative and adds great substance to the plot of a story! I found this book at a time when I was considering a career change, but the thought of moving to a job where I would be making less money (though it would put me on a path to a dream career) seemed daunting. The author provided some easy exercises the reader can complete to get a clear idea of what they want to do in their career and manageable steps to take in pursuing it. I enjoyed the personal examples he provided and found the book to be very encouraging and well worth the read.